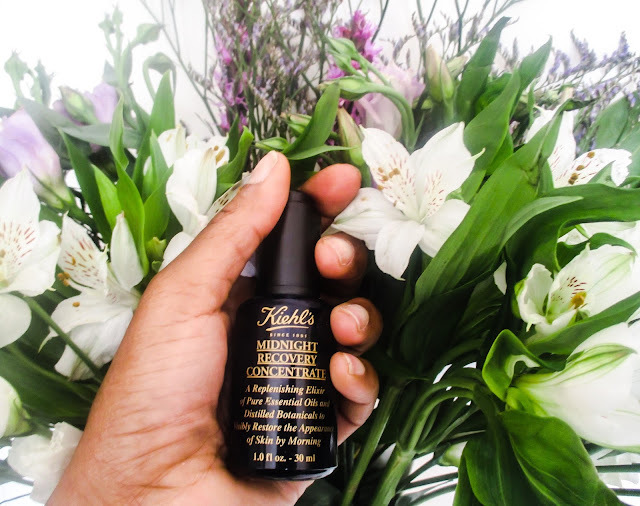 I have been eyeing up this beauty product for a while, ever since I did my Morning Skincare Routine post were I told you lovelies all about the Kiehl's Daily Reviving Concentrate and my fellow mumma blogger babe Cat. I purchased this product a few weeks ago so that I could put it to the test before I let you guys know all about it. This is a dream boat of concentrates. I apply after I have cleansed my face at night and I only use a few drops. I do not use this every night, but I say every other as I pair it with the morning version. Once applied I do not feel the need to apply a night cream as this serum certainly packs a punch and would not want to cover up the beautiful essential Lavender oil. When I wake up in the morning I certainly see a noticeable difference, in complexion and perkiness and leaves me looking hydrated and glowing, especially after a night out and I know my skin will need a little pick me up! For me what I truly love is that it is paraben-free. Since becoming a mumma I am more health conscious, I was never before and would be fine to slap anything on my skin. Fast forward to the present day and knowingly knowing that I am able to apply something that is free from potential harmful chemicals excites me is that weird?! I want to protect my skin my daughters too, not that I apply this on her, but children's brands that are chemically free and natural, but that is for another post. Priced at £37.00 per bottle, but I happen to know that if you head in to a Kiehl's store near you soon, they currently have an amazing offer on where you can purchase both the Midnight Recovery & the Daily Reviving Concentrate which you can bag them both for £59.00, saving you £15.00 bargain or what! Leanora & I are off on our holidays soon, woo hoo! I will certainly be packing this baby with me as I think it will be brilliant to use on the flight so once we land my skin will be looking great and holiday ready. I wonder if they have a travel kit?! I absolutely love the Midnight Recovery Concentrate! It's the first product I have tried from Kiehl's and I definitely do not regret it. I opted for the 50ml, and a little goes a long way. I would highly recommend their Turmeric and Cranberry Seed masque if you're looking for a face mask packed with goodness to really brighten your complexion! This sounds amazing! I hear so much about Kiehls but I find them a little intimidating. There's so many products that I don't feel like I know enough about to purchase with confidence, if that makes sense? There's a store around the corner from me on Kind Street but I've never plucked up the courage to go in! Maybe I should!